It's not too late - you can join too! Reading begins July 11th and ends October 8. I joined once before but didn't finish. This time I will finish even if I don't in 90 days! But I have my quiet time set more habitually now so I'm pretty sure I can do this. No, not pretty sure - I CAN DO THIS! And you can too! As the 4th approaches and freedom reigns, the freedom I have in Christ is in my every thought. The Bible is God's special gift to me so if I can read other books I can choose to read His first! This is the living book! So, are you signed up already? Are you headed to do that right now? Who are you? Inquiring minds want to know in the comments section below. If you've visited here often, you know I need accountability!! You can do it! 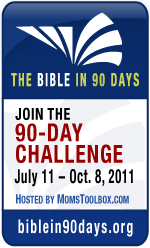 I signed up last year for one of the Bible in 90 Days "sessions," but it took me more than 90 days to actually finish. Now I'm reading the entire Bible again, but more slowly this time. I've been using You Version on my cell phone, and it keeps up with where I left off the day before. I'm really enjoying it! @Bibbity Bobbity Boo - I understand completely!